I stocked up on seafood and pineapple this week! I also used a $1 catalina, so my total ended up being $13.80 after coupons and my receipt says that I saved $10.73. 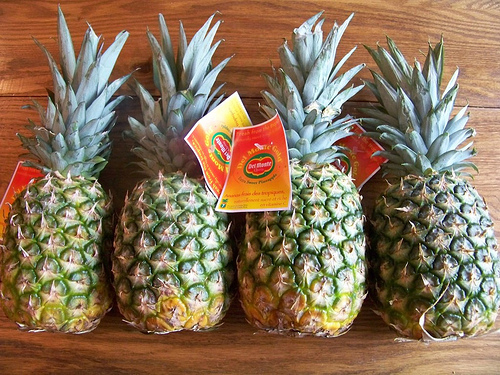 Pineapple was on sale for only $0.99 each at Aldi this week so we bought four! I’m looking forward to fresh pineapple — yum! 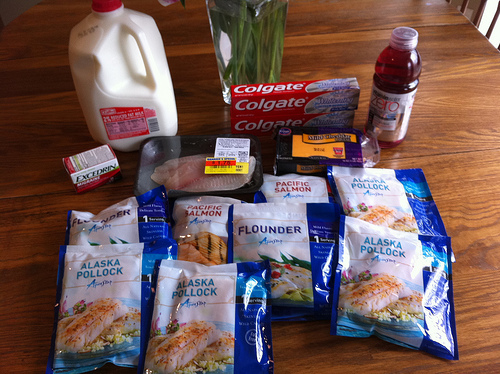 Health Food Store Shopping Trip #1: Spent $12.90 — see the complete price breakdown and details of this shopping trip. 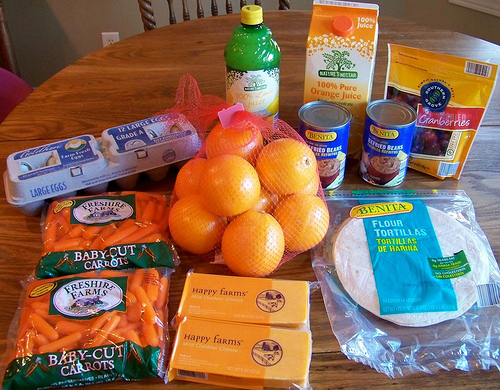 Aldi Shopping Trip: Spent $16.79 — see the complete details and price breakdowns of this shopping trip. 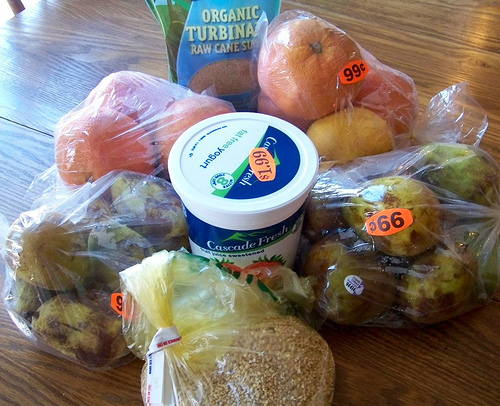 Health Food Store Shopping Trip #2: Spent $19.35 — see the complete details and price breakdown of this shopping trip. At any rate, these are back and will now be posted every Saturday afternoon; I’d love to have you participate! 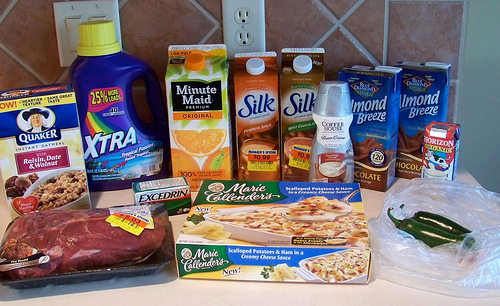 Would you like to know what the best deals and coupon match-ups are for your local stores? Be sure to check out the Store Deals section of our site where we post the best deals and coupon match-ups each week for over 100 different stores across the country! You can sign up to receive the top deals in your email inbox each week as soon as they are posted! Super Savings Saturday: Organic bread for $0.99 per loaf! 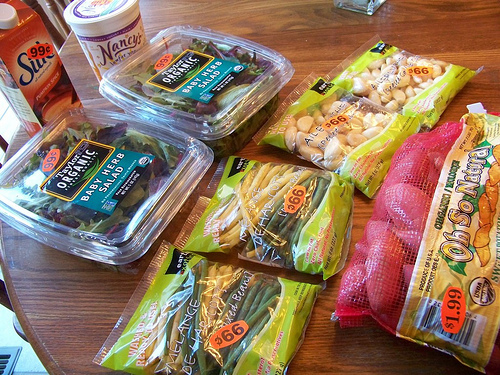 I scored big time at the health food store this week! 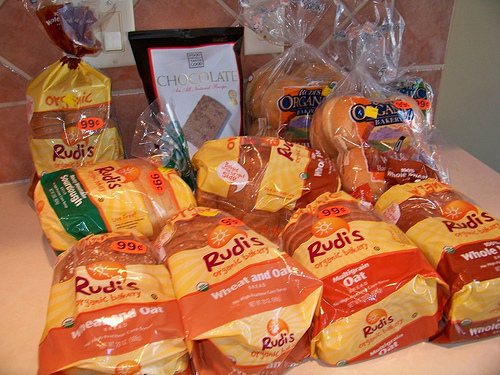 They had a cart full of Rudi’s Organic Baker bread and buns marked down to $0.99. 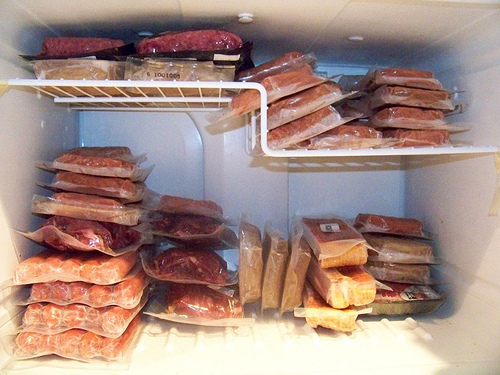 I picked up ten loaves/bags and filled up our freezer with enough bread to last at least a month! I also picked up my free bag of Food Should Taste Good chips. And I stopped by Hallmark this afternoon and used my $5/$5 coupon. They have wrapping paper on sale for Buy One at $4.99, Get a Second Roll for $0.99. So I bought two rolls, used my $5/$5 coupon and got both rolls for $0.99 plus tax. So those were my best bargains of the week. Can you believe that I actually ended up not buying anything on Black Friday or Cyber Monday? I was planning on possibly getting a few things, but when I took inventory of our home and children’s clothes, there wasn’t anything we needed. Plus, I already have almost all of our Christmas gifts purchased, so I just kept my money. A few weeks ago, there was a Groupon for Kansas City Steaks. I had accumulated some Groupon referral credits (thanks to some of you who ordered through my referral link! ), so I bought five $50 vouchers to Kansas City Steak Company for $25 each (well, they were free with my Groupon credits). 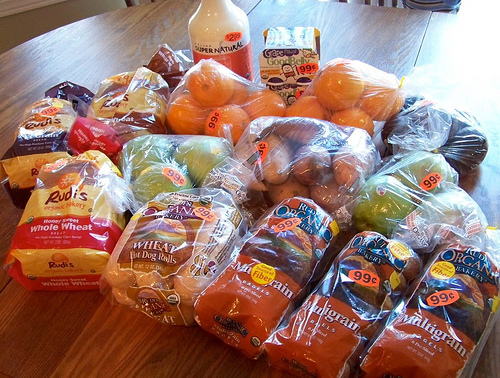 And then we worked it out so that our orders totaled less than $0.50 each shipped. Not too long ago, we went through one of Jesse’s boxes from his childhood things and the girls were delighted to discover his soccer shirts. They are one of their favorite things to wear now! 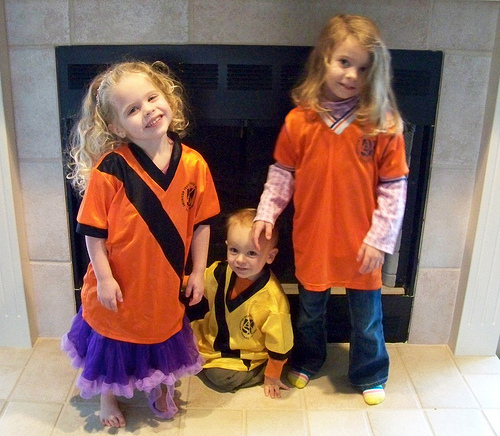 Early this week, the girls decided they all wanted to dress up in soccer shirts and have me take their picture, so I obliged. We also took a field trip to a nearby museum which re-creates what some of the buildings in our county would have looked like in 1865 to 1880. The children thoroughly loved it. 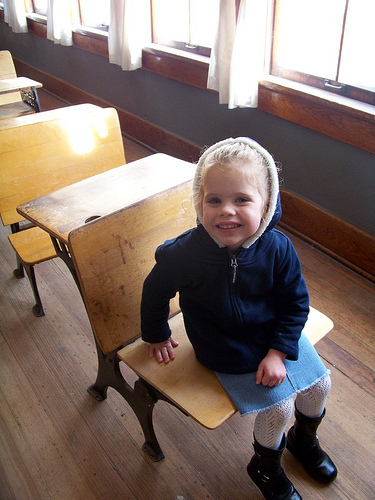 The girls loved the schoolhouse, log cabins and general store as we’re reading through the Little House on the Prairie series together at lunch and these were similar to the ones in the Little House books. 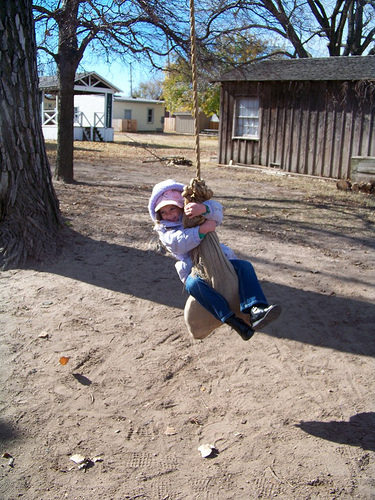 The tree swing was a favorite! Silas tried his hand at the hoop ‘n stick. Can you tell this boy has some personality?! 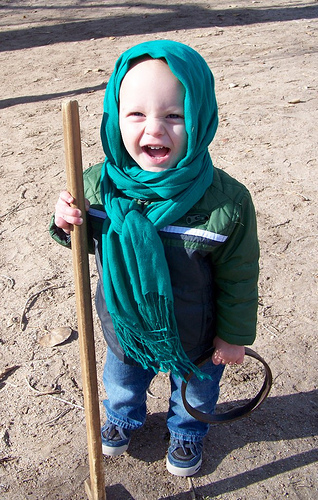 Since it ended up being colder than we were expecting, I turned my scarf into a sort of head wrap for him to bundle him up a little more. So he was sporting quite the interesting look. But he didn’t care; he was having a blast! I stopped by Dillon’s to pick up some of the Annie’s Mac & Cheese which was on $0.49 when you bought 10. The children love this stuff, so I always stock up with enough to last us for at least six to eight weeks when it goes on sale. 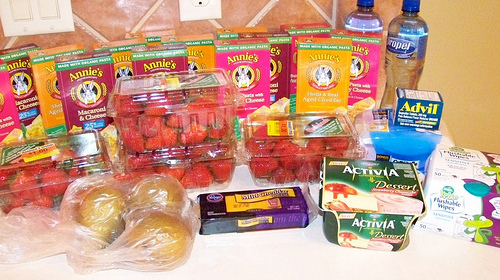 I also found strawberries marked down to only $0.99 per package, so I snatched up some of those to freeze for smoothies. 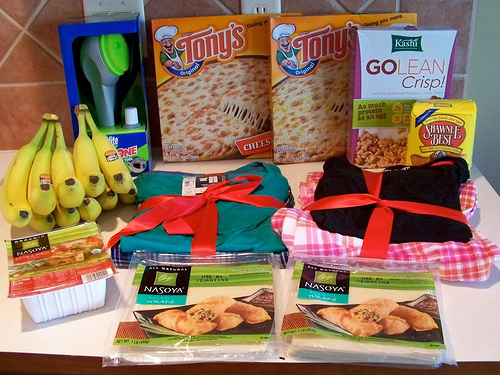 And then I picked up a few other deals and freebies. My total was around $21 at Dillons. 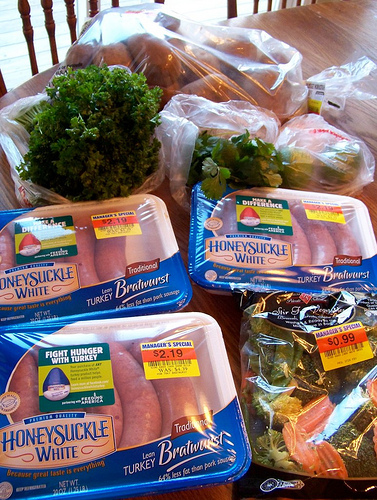 Later on in the week, I swung by the health food store to see if there were any great mark-downs. I was extremely excited to find organic, hormone-free ground chuck marked down from around $6 per package to only $1.99 per package! 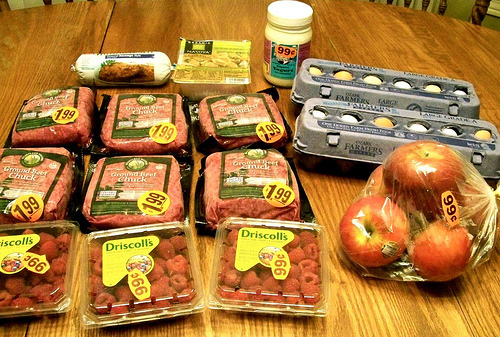 I also found raspberries marked down to $0.99 (which I’ll also be freezing) and a bag of organic apples for only $0.99 plus a few other items. My total there was around $21, too. And then I bought farm-fresh eggs from my brother. 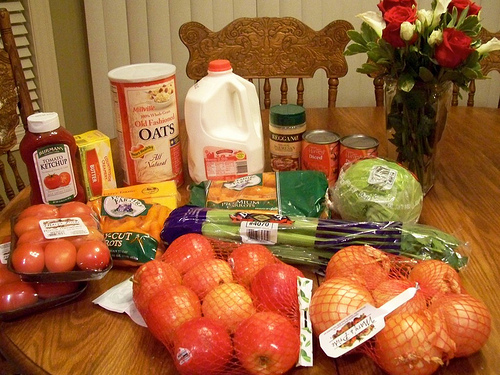 So our grocery expenditures ending up totaling around $46 this week.